Some accessories are a must if you want to play bass guitar, but then there are all those cool extra accessories and gadgets. Take a look at the best gadgets for bass guitar. You may not need them, but that doesn’t mean you can’t still want them. First of all, a good headphone amp, like the one shown here, allows you to play at all hours of the day or night without disturbing anyone, so you can get in all the practice you can stand. A professional headphone practice amp. Bassists don’t usually bother with a lot of effects pedals (gadgets that alter the sound). However, a little special effect during a bass groove or solo can add some spice to your music. Here are some effects pedals you might want to consider. A volume pedal. A volume pedal lets you adjust the volume with your foot, even in the middle of a tune. Chorus unit. A chorus unit makes your bass sound like two basses being played together. A chorus unit and a volume pedal. Flanger/phase shifter: These devices create a whooshy, swirly sound, similar to the Hammond organ. Digital delay: This device creates an echo of the notes you play. You can also use it to record a short, rhythmic phrase that repeats. Distortion: This device distorts your sound, making it rough and dirty. It’s a more common effect with guitar players, but bassists can use it too, especially for hard-rock tunes. Envelope filter: This device makes your bass sound like a funky keyboard bass. It makes it sound as though a synthesizer is playing the bass part. Octave pedal: This device doubles your bass notes (either an octave above the note you’re playing or an octave below). Multi-effects unit: A multi-effects unit is an all-in-one effects unit. 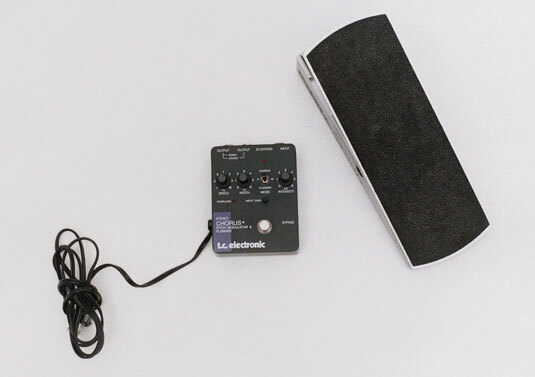 It can be programmed to alter your bass sound in several ways at the touch of a foot pedal. Cool, yes, but you will have to do a lot of homework to learn all the bells and whistles, and you’ll have to play more than a handful of gigs to save up the funds to buy it. You can have a lot of fun with the gadgets, but don’t get carried away. Remember, you’re the bass player, not the guitar player.